As we look back on 2018, we’re reminded of how many journalists are seeking opportunities to acquire new skills, share best practices, and network with colleagues online and in person. These opportunities are at the heart of what we do at the Knight Center for Journalism in the Americas, and they align with our goal of helping journalists from around the world who want to improve the quality of journalism in their countries. In 2018, we accomplished this goal through a mix of professional training, organizational capacity building, conferences, and publications. With the new year underway, we invite you to take a look back at the Knight Center’s activities in 2018 -- and take part in what we have planned for 2019. In 2018, the Knight Center offered 16 online courses -- in English, Spanish, and Portuguese -- that reached 41,197 students from around the world. This is a record high for the Knight Center, which reached about 34,000 students with 11 courses in 2017. Since launching our massive online courses in 2012, the Knight Center has held 51 courses that have reached 164,000 students from 200 countries and territories. Our 2018 courses focused on topics such as artificial intelligence, fact-checking, data visualization, podcasting, and video production, and were offered in English, Spanish, and Portuguese. They were taught by 28 different experts, including Andrew Ba Tran, an investigative data reporter at The Washington Post; Craig Silverman, media editor for BuzzFeed News; Laura Zommer, executive director of Argentine fact-checking site Chequeado; Guilherme Jardim Duarte, data editor at Brazilian site JOTA; and Alberto Cairo, Knight Chair in Visual Journalism at the University of Miami and the director of the visualization program at the university's Center for Computational Science. Many of our courses were the result of collaborations with other organizations. In the spring, for instance, we offered a Spanish-language course titled "Risk and security in journalism in Latin America: practical steps for self-protection” in partnership with the International Women’s Media Foundation. We also worked with the United Nations Educational, Scientific, and Cultural Organization (UNESCO) and the Special Rapporteur for Freedom of Expression of the Inter-American Commission on Human Rights (IACHR) to offer a Spanish-language course for judges and other justice system operators in Latin America. The course helped 1,953 judges and other justice system operators reinforce their knowledge about the international standards that govern freedom of expression, access to public information and the protection of journalists. Additionally, we held two courses in partnership with Microsoft. The courses, which were offered in Spanish and Portuguese, focused on artificial intelligence and its impact on journalism. In 2018, we also began to publish the instructional materials from our MOOCs. Previously, when our courses ended, students no longer had access to the materials. Now, students can continue accessing readings and videos from most of the courses by visiting our library of course resource pages. These resources are also available to individuals who couldn’t attend the course but are interested in the subject matter. This initiative extended the Knight Center’s objective of democratizing, as much as possible, access to journalism education to anyone from anywhere in the world. We have several new courses lined up for Spring 2019, including a course on news algorithms, mobile journalism, and documentary photography. You can keep up with our latest course offerings at journalismcourses.org. 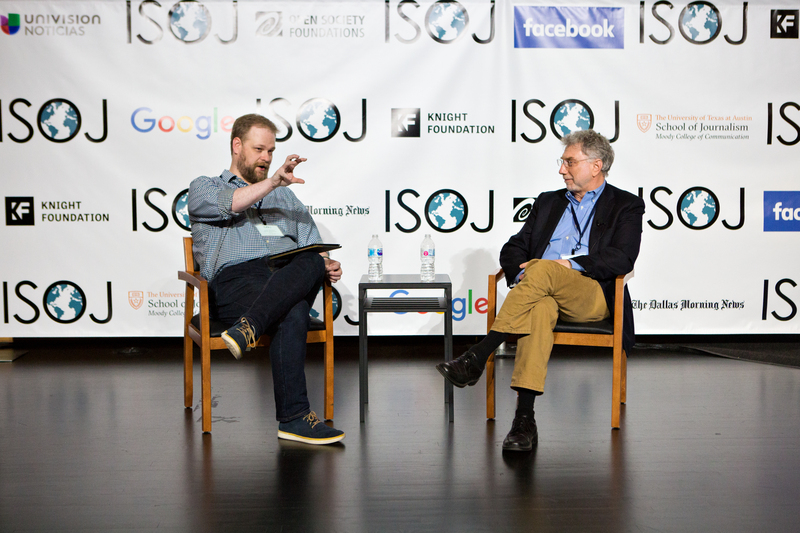 The Knight Center held the 19th edition of its annual International Symposium on Online Journalism (ISOJ) last April, attracting 440 participants from 43 countries. Thousands more followed the symposium from afar via our expansive online coverage, including live video streaming on YouTube. The symposium -- which was held at the University of Texas at Austin’s Blanton Museum of Art -- bridged the gap among professional journalists, media executives, digital news innovators and academic researchers in the U.S. and abroad. In bringing together such a diverse array of attendees and speakers, we provided journalists from around the world an opportunity to engage in dialogue, explore potential collaborations, and share insights and ideas about the latest developments in online journalism. The speakers shared their experience and expertise on topics such as virtual reality, blockchain, newsletters, audio, newspapers’ role in a post-advertising era, trends in online journalism research, and more. All of the speakers’ talks had simultaneous interpretation into Spanish, allowing for greater participation from Latin American attendees. The 2018 symposium also featured academics who contributed to the research component of ISOJ, which has been in place since 2004. Scholars from around the world submitted papers to a blind review process, and six winners then presented their research at the symposium. Their research, which focused on changing approaches to reporting and storytelling, was published in the 2018 edition of #ISOJ, the official journal of the International Symposium on Online Journalism. The day after ISOJ, we held our 11th annual Iberian American Colloquium on Digital Journalism, a Spanish-language seminar offered to ISOJ attendees from Latin America, Spain and Portugal. The colloquium attracted about 125 journalists who came together to share their projects and make connections. One panel featured six journalism innovators who shared valuable lessons about how they are finding ways to be innovative through comic journalism, interactive graphics, transnational collaboration and diverse revenue models. Another panel addressed security-related measures that journalists can take when investigating corruption issues in Latin America, while another looked at how Ibero-American journalists are finding new ways to engage with their readers using new online tools and platforms. Nicole Tung, award-winning freelance photojournalist covering social and conflict-related issues in the Middle East, Asia, and Africa. In 2018, the Knight Center’s trilingual blog, Journalism in the Americas, published nearly 1,000 stories in English, Spanish and Portuguese. The coverage focused on issues related to press freedom in Latin America, as well as the ways in which journalists are taking innovative approaches to reporting and storytelling. Some of 2018’s top stories were part of a Journalism in the Americas series about innovative journalists in Latin America. With support from the Open Society Foundations’ Program on Independent Journalism, the six-month-long series offered up helpful stories and guides. It featured 12 media outlets and two freelance graphic artists from 12 different Latin American countries: Argentina, Bolivia, Brazil, Chile, Colombia, El Salvador, Guatemala, Honduras, Mexico, Paraguay, Uruguay, Venezuela. Each story was accompanied by a list of lessons learned from the innovators featured. The stories explored topics such as how graphic artists are using comic journalism to illustrate problems that Latin Americans face; how newspapers like Uruguay’s La Diaria and Guatemala’s Nómada are experimenting with different revenue models; and how organizations like Mexico’s Animal Político are collaborating with other organizations to enhance their coverage and expand their resources and reach. Other stories focused on events, fact-checking, investigative reporting, residency programs, crowdfunding, satire and online video, collective ownership, innovation labs, citizen journalism, and more. Some of the stories delved into innovators’ backgrounds to show the paths they took to become innovators. And many showed how teams of innovators from different parts of the newsroom (designers, programmers, writers, and more) worked together to create new and interesting initiatives and projects. The guides, meanwhile, took a deep dive into four key topics: design thinking, crowdfunding, financing independent digital media, and transnational collaborations. The guides were aimed at deepening Latin American journalists’ knowledge and understanding of these topics while helping them to strengthen their current skill-sets and develop new ones. They were also written by prominent journalism leaders throughout Latin America, allowing for first-person tips and lessons learned. The stories and guides in the journalism innovators series were compiled into a comprehensive book available in print and online. The ebook, titled “Innovators in Latin American Journalism,” was announced at the Knight Center’s 11th Ibero-American Colloquium for Digital Journalism and was later published on the Knight Center’s Journalism in the Americas website in English, Spanish, and Portuguese. All three versions are available for free in the Knight Center’s Digital Library. The Knight Center is currently working on the publication of another ebook related to membership models for news organizations, scheduled to be published in Spring 2019. We’re grateful for all of our supporters who help make our work possible, including Open Society Foundations, the Ford Foundation, the Moody Foundation, Google, Facebook, Microsoft, UNESCO, OAS/ICHR, the International Women's Media Foundation, The Dallas Morning News, Stanford University’s John S. Knight Journalism Fellowships, Univision, and last but not least, our biggest supporter -- the Knight Foundation. And we’re grateful for our dedicated Knight Center community. We hope you’ll take some of our courses, follow our blog, read our publications, and join us at ISOJ in April. We look forward to engaging with you in the year ahead!